A sharp and illuminating history of one of capitalism's longest running tensions—the conflicts of interest among public company directors, managers, and shareholders—told through entertaining case studies and original letters from some of our most legendary and controversial investors and activists. A hedge fund manager and an adjunct professor at Columbia Business School, Gramm has spent as much time evaluating CEOs and directors as he has trying to understand and value businesses. He has seen public companies that are poorly run, and some that willfully disenfranchise their shareholders. 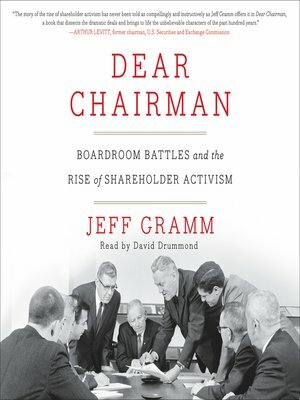 While he pays tribute to the ingenuity of public company investors, Gramm also exposes examples of shareholder activism at its very worst, when hedge funds engineer stealthy land-grabs at the expense of a company's long term prospects. Ultimately, he provides a thorough, much-needed understanding of the public company/shareholder relationship for investors, managers, and everyone concerned with the future of capitalism. Jeff Gramm runs a hedge fund and has served on several public company boards of directors. He is an adjunct professor at Columbia Business School, where he teaches value investing. Jeff lives in Brooklyn, New York, with his wife and two children.